EA is giving players two ways to enter Battlefield™ V — DICE’s unprecedented take on World War 2 — with a Standard and a Deluxe Edition. 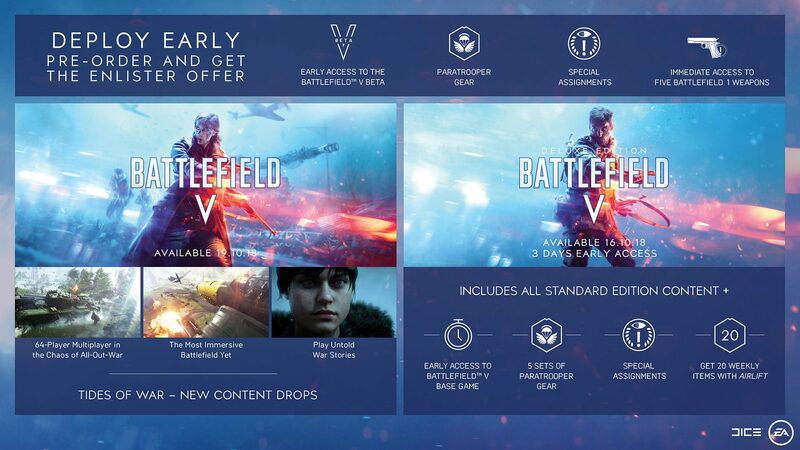 The Enlister Offer gives players who pre-order either Battlefield V or the Battlefield V Deluxe Edition early access to the Battlefield V Open Beta and additional in-game benefits at launch*. Check out the full details below. Battlefield V returns to the roots of the series in World War 2, as you fight in large-scale and unexpected locations across the globe. Take on physical, all-out multiplayer with your squad in new experiences like the vast Grand Operations and the cooperative Combined Arms. Experience the human impact of some of the war’s most crucial moments in the returning single player War Stories. With the Battlefield V Deluxe Edition, you’ll be able to customize your Company of soldiers with Special Soldier Sets containing stunning weapon skins, camo patterns, head gear, and face paint for the British Special Air Service and German Airborne troops. No special forces unit is more storied than the British SAS, who dropped behind enemy lines during some of the most perilous missions of the war. Similarly, the German Fallschirmjäger troops defended their air bases from invaders. The Battlefield V Deluxe Edition lets you bring in these special forces from the beginning of your journey. Early Access to the Battlefield V Beta: Be one of the first to forge the frontlines as you test your playstyle and strategies in an ever-changing World War 2. Immediate Access to Five Battlefield 1 Weapons: Unlock five of the Great War’s most modern weapons for use in Battlefield 1, as you bridge the interwar period on the road to Battlefield V.
Five Sets of Paratrooper Outfits: Choose five Special Soldier Sets from the eight available when deploying as the British Special Air Service or German Airborne troops. Wade into 64-Player Multiplayer: Pick your class and assemble an arsenal to join the return to all-out war as you shape the fight the Battlefield way. Utilize the Battlefield: Maneuver through the battlefield using a soldier move set, fortifications, and mobile tools of destruction. Play Untold War Stories: Witness human drama set against global combat in the single player War Stories. Experience the Tides of War: Embark on a journey across evolving battlefields, where you and your Company will never be the same. Witness a huge variety of key WW2 locations where new battlefields, challenges, and gear await.